Will Russia buy the aging, semi-finished Slava-class CG Ukraina? Probably not, unless the price is really right, i.e. basically zero. 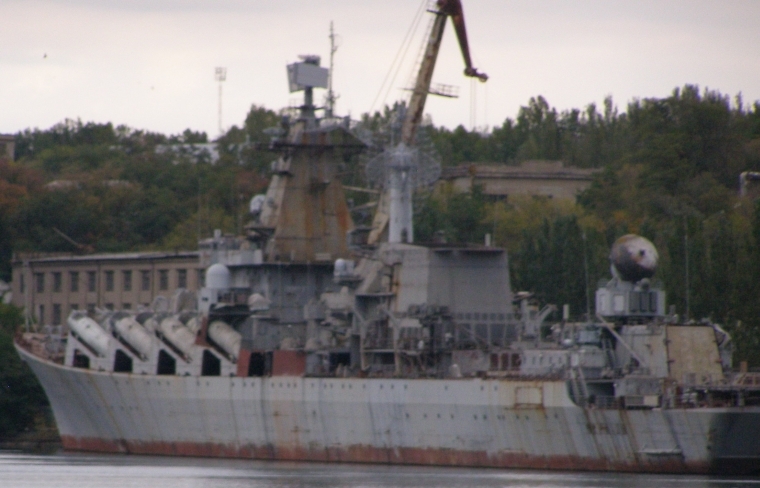 It’s unlikely Russia will pay Ukraine to complete the cruiser because Russian shipyards have suggested towing it to Russia, refurbishing, and updating there. The questions are compelling only because of a recent video, varying reports about the ship and a possible deal, and what this all says about Moscow’s military procurement. Military parity highlighted Podrobnosti.ua’s video. Like the photo above, the video shows a major combatant in declining condition. Nevertheless, according to recent ITAR-TASS, Ukraine’s Defense Minister is optimistic Kyiv and Moscow will finish Ukraina together. And he claims the ship is 95 percent complete. By way of review, Ukraina is a 1970s- or 1980s-vintage design being constructed as Fleet Admiral Lobov at Nikolayev’s [Mykolayiv’s] 61 Communards Shipbuilding Plant when the USSR collapsed. Kyiv failed to find a foreign buyer for the ship, and reportedly spends $1 million every year maintaining it. So that doesn’t mean a plethora of options or a very strong negotiating position for the Ukrainian side. Talk of Russia buying Ukraina peaked last year in the wake of the base agreement extension between Moscow and Kyiv. News outlets noted that the acting chief of the Russian Navy’s Technical Directorate inspected the cruiser and declared it 50 percent ready. He said Ukraina would need 15 billion rubles for repairs and 35 billion for modernization — $1.7 billion in all. The Navy’s 50 percent sounds a lot more like the 70 or 75 percent we’ve been hearing for many years than the Ukrainian Defense Minister’s 95 percent. Reported pricetags for Ukraina, in its current shape, start at $70 or $80 million and run to ridiculous numbers. In January, Argumenti.ru reported the Russian Defense Ministry would not pay scrap metal prices for Ukraina, but commented that Moscow would accept the ship as a gift. Then there’s also the issue of whether the Russian Navy really needs it. It’s an issue often forgotten in procurement debates. Granted Ukraina is a something of a special case. But it should also be a pretty easy decision. All that said, the Russians might buy Ukraina anyway. If they do, it’ll indicate a new State Program of Armaments gone awry in its first year.